The rags-to-riches story — everybody loves one. That is what happened about 3,000 years ago to an entire nation, when Israel ascended to supremacy in the Near East. Only five centuries earlier this small nation was enslaved in Egypt. But by the time of King Solomon — the wisest, richest and most honored monarch ever — Israel's dominion stretched from Egypt on the west to the Euphrates River on the east (II Chronicles 9:26), from Hamath on the north to Ezion Geber at the head of the Gulf of Aqaba on the south (II Chronicles 8:4, I Kings 9:26). The once mighty kingdoms of the Egyptians and Hittites were in eclipse, and Babylon was yet to fully exercise the military, political and economic muscle that would establish it as the first world-ruling empire four centuries later. The time was ripe for Israel's rise and Golden Age. For a fleeting and glorious moment Israel, perhaps the most unlikely choice from among the many peoples of the Near East, was the unquestionable master of the Fertile Crescent. But why Israel? Why under the rulership of Solomon? As we approach the Feast of Tabernacles, a look at Solomon's Israel can be instructive. Solomon's rule points, in type, to the time when Jesus Christ will return to earth and establish the Kingdom of God, showing us the kind of conditions we can look forward to during the world tomorrow. Let's take a look and see. Solomon's rule was an oasis of peace in Israel's long history of wars with enemies throughout the Near East. From the time of its arrival in the promised land, the nation of Israel encountered opposition. Because they obeyed God imperfectly (and sometimes not at all), God allowed the Israelites to be attacked often, and frequently even to serve as vassals to hostile neighbors. Not until the reign of King David, Solomon's father, did Israel finally destroy or sub-due most of the pagan peoples who lived about them. David prepared the way for his son by eliminating Israel's foes or putting under tribute the non-Israelites who remained in the area. Because David was a man after God's own heart, God empowered him to overcome Israel's adversaries. By the end of David's rule, God had granted David "rest from all his enemies all around" (II Samuel 7:1, 9, 11). When Solomon ascended to the throne, "he had peace on every side all around him" (I Kings 4:24) and "rest on every side" (I Kings 5:4). By careful design, God at the appropriate time gave "rest to His people Israel, according to all that He promised" (I Kings 8:56). God names things for a purpose. God's servant David named his son Shelomoh or Solomon, a Hebrew word meaning "peaceful" or "peaceable," derived from the Hebrew shalom meaning "peace." In His plan of salvation for humankind, God designated a time when peace would once and for all prevail, and He used a ruler whose name meant "peaceable" to govern Israel three millennia ago. Solomon's reign is a picture or a physical type, albeit on a minor scale, of the world peace that will accompany Jesus Christ's millennial rule. Today, much as David prepared the way for Solomon's peaceful reign by conquering the enemies surrounding Israel, Jesus is preparing the way for His Second Coming and the establishment of world peace by choosing, developing and working with His spiritual nation, the Church of God. God is developing Christian warriors (Philippians 2:25) able to overcome Satan, Satan's society and their own carnal natures. One of the most important lessons is learning to live the way of peace. Appropriately enough, the Church is learning to live by the only laws that can bring peace among human beings (John 14:27). Today there is peace in God's Church, and God is its source (Romans 5:1). The peace to accompany Jesus' millennial rule is a central portion of the Gospel message that the Church of God preaches to the world in this end time (Ephesians 2:17). When Jesus Christ returns, He will have an experienced, capable staff of administrations (Revelation 1:6,5:10) who have, learned to apply the principles of peaceful living and who are qualified to assist Him in carrying God's government throughout the world (Revelation 20:4). As representatives of God's headquarters government in Jerusalem, the "city Of, peace" ("salem" coming from the Hebrew shalom), the spirit-born members of the God Family will help teach the nations how to live peacefully with each other (Isaiah 2:3). As the knowledge of God's peaceful way gradually permeates the globe (Isaiah 11:9), these nations will finally "beat their swords into plowshares, and their spears into pruning hooks; nation shall not lift up, sword against nation, neither shall they learn war anymore" (Isaiah 2:4). And, as Solomon's name meant "peaceable," so one be Jesus Christ's titles during the Millennium will be "Prince of Peace" (Isaiah 9:6). He will direct human affairs to, enforce the peace that has eluded humanity for so long. Freedom from the distractions and dislocations brought by war made Solomon's rule not only peaceful but prosperous. Under his direction, Israel built a flourishing and lucrative empire. The magnitude of the king's daily provisions alone gives some sense of the enormous production that Israel enjoyed during those days (I Kings 4:22-23). The Jewish historian Josephus writes of "a wonderful increase when they [Israel] betook themselves to husbandry and the cultivation, of their grounds" (Antiquities of the Jews, VIII, ii, 3). That Israel "dwelt safely, each man under his vine and his fig tree" shows that the benefits of abundance extended beyond the royal court and the aristocratic classes to the common people (I Kings 4:25). The author of I Kings depicts Israel during these days "as the sand by the sea in multitude, eating and drinking and rejoicing" (verse 20). Solomon prospered commercially as well. His kingdom existed at an auspicious time and in a favorable location. The domestication of the camel by the 11th century B.C. spurred caravan trade, which passed directly through Solomon's territories. Israel gained rich revenue from the merchants seeking passage across Palestine (I Kings 10:15, II Chronicles 9:14). Solomon exerted a controlling influence on the transportation industry of his day by serving as the middleman in sales of Egyptian chariots and horses to peoples living in Asia Minor (I Kings 10:28-29). Archaeologists have found evidence of smelters, furnaces, crucibles and refineries in the south at Ezion Geber, where they suspect Solomon developed a copper mining and refining industry. Solomon even initiated maritime trade that, according to biblical authorities, took Israelite ships far and wide and that brought back gold, silver, ivory, apes and peacocks (verse 22). Indeed, the agricultural and commercial successes of the kingdom brought unprecedented wealth and prosperity. Solomon "made silver as common in Jerusalem as stones, and he made cedars as abundant as the sycamores which are in the lowland" (verse 27). Josephus writes of Solomon's select corps of horsemen, chosen from the most athletic and able-bodied young men in the nation. These men, riding perhaps the finest and best-groomed mounts in the Near East, wore expensive garments of purple from Tyre and had "dust of gold every day sprinkled on their hair, so that their heads sparkled with the reflection of the sunbeams from the gold" (Ibid., vii, 3). The wealth and abundance of Solomon's kingdom were but a type of something far greater to come. As God's government becomes universal, the world will enjoy riches that are scarcely imaginable, even in today's wealthy nations. Notice these promises: During the Millennium, "the plowman shall overtake the reaper, and the treader of grapes him who sows seed" (Amos 9:13-14). Proper weather conditions (Isaiah 30:23-24, Ezekiel 34:26, Joel 2:23) and irrigation of desert regions (Isaiah 35:6-7) will boost production of grains, fruits and livestock (Isaiah 35:1-2, Ezekiel 36:11, Joel 2:19) for those who are willing to submit to God (Malachi 3:10-11). It is interesting that Micah 4:4, speaking of God's Kingdom, uses the same words used in I Kings 4:25, which refers to Solomon's rule. People will have their own resources and be able to provide for their own needs in the world tomorrow. As in the days of Solomon, Israel's population will increase; people will be truly happy, settled in a beautiful and productive land and living in attractive homes (compare Ezekiel 36:9-11 with I Kings 4:20). The cities of tomorrow, like those built under Solomon centuries ago (compare I Kings 9:15-19, 24, to Isaiah 58:12), will thrive and prosper. Joel wrote an encouraging description of the future, proclaiming that "the mountains. shall drip with new wine, the hah. shall flow with milk, and all the brooks of Judah shall be flooded with water; a fountain shall flow from the house of the Lord" (Joel 3:18). It is this bright and glorious future toward which true Christians look. 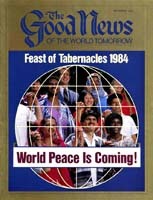 It is this wonderful world tomorrow that is depicted by God's Feast of Tabernacles. As we read the Bible account of Solomon's rule, we gain a glimpse into the future and the true peace and prosperity that will renew this sick, sorrowful world. For more information about Jesus Christ's millennial reign, read our free book The Wonderful World Tomorrow - What It Will Be Like.